On May 31st. 1941 a revolutionary new show had been meticulously planned and organised but no-one knew where it was on and no-one knew who was appearing in it. It was secret and it was happening live. A simple comedy and music programme became part of the national fabric, serving the British population from the Blitz to the Beatles. It was one of the very first touring variety shows on the BBC and was scheduled to run for 6 weeks but went on broadcasting for a staggering 23 years. It was one of the longest running radio shows in history. Worker's Playtime started out on the BBC Home Service and was broadcast live from a factory canteen "Somewhere in Britain". The programme had the total support of the Government because the shows were needed to support the war effort on the Home Front. Worker's Playtime was a touring show, with the Ministry of Labour choosing which factory canteens the show would visit. 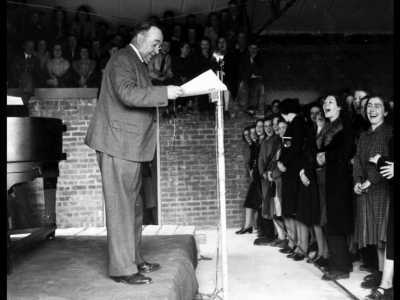 Throughout the War, Ernest Bevin the Minister of Labour and National Service, would appear on these shows from time to time to congratulate the workers and exhort them to greater efforts. When the War ended it was realised that the show had worked, and that meant that Ernest Bevin wanted Worker's Playtime to continue to raise the morale of the workers, whilst the Government rebuilt Britain and the British economy. Little did anyone know at the time that the programme would continue until 1964. The BBC, for their part, were very happy to continue with a show which had proved a national success even if it did mean transporting crew, cable, microphones, two pianos, a producer, two pianists and a bunch of variety artists up and down the country three times a week. On 1st. October 1957 the programme switched to the Light Programme, a move which seemed to recognise that the programme no longer had the national sense of purpose which made it so essential during the war and the post-war peace. For all 23 years of its existence, the producer was Bill Gates and he would always finish each programme by wishing "Good Luck All Workers!". Many famous variety, vocal and comedy artists appeared over the years such as Charlie Chester, Peter Sellers, Tony Hancock, Frankie Howerd, Ann Shelton, Betty Driver, Eve Boswell, Dorothy Squires, Julie Andrews, Morecambe and Wise, Peter Cavanagh, Janet Brown, Bob Monkhouse, Peter Goodwright, Percy Edwards, Ken Dodd, Ken Platt, Elsie and Doris Waters and many, many more. In November 1940 a predecessor programme called 'Works Wonders' took to the air. It was a series of mid-day programmes staged in factory canteens, and was described as 'A lunch-time concert presented to their fellow workers by members of the staff of a large munition works "Somewhere in England". Arranged by Victor Smythe.' The compere was a very young Bob Monkhouse and the producer was Brian Johnston.